doesn’t have to mean you have to say good-bye to chocolate chip cookies. It can, however, be difficult to find a recipe that gives you exactly what you’re looking for in terms of filling the gap left by lack of the traditional version. Depending on what you’re looking for, this cookie may or may not be for you. These cookies are soft and chocolatey. They start out a little crispy, but soften over time. I say they may not be for everyone because some people are super particular about how they like their chocolate chip cookies. Some prefer chewy, some extra crispy. Personally, I like a soft, extra chocolatey cookie, thank you very much! These bad boys re-heat incredibly well and make the perfect compliment to a cup of hot coffee. If you try them, drop me a line and let me know! This is a soft chocolate chip cookie made with almond flour and Swerve brown sugar. 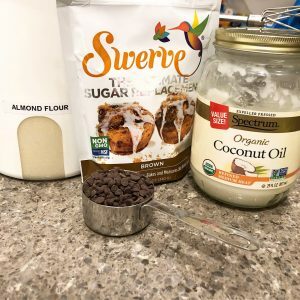 It is low-carb, keto, and gluten-free. Perfect to satisfy any sweet tooth! Preheat oven to 350 degrees. Line a baking sheet with silicone mat or parchment paper. In the bowl of a stand mixer (or using a hand mixer), cream the butter, coconut oil, and brown sugar. Add the vanilla and eggs, mixing until incorporated. Add the baking soda and salt. Add the almond flour, 1 cup at a time, beating well after each addition. Fold in the chocolate chips with a rubber spoon or spatula. 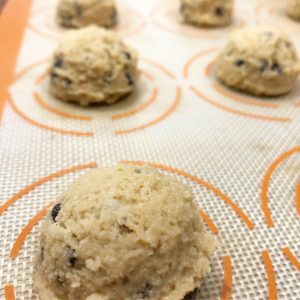 Using a scoop, drop the dough into tablespoon rounds and place on the lined baking sheet about 3 inches apart. Bake for 12-13 minutes, or until golden brown around edges. Let the cookies cool for as long as you can stand it, and then enjoy! 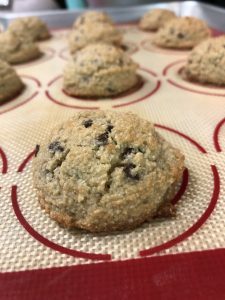 These cookies are perfect for a cup of coffee and they keep great in the fridge or freezer (assuming you have any left). Did you enjoy this post? I invite you to subscribe via RSS or e-mail to receive all post updates, including delicious, easy-to-follow recipes! This blog is Pinterest friendly and I encourage everyone to pin their favorite recipe. I simply ask that if you post my recipes/images on your blog or website, that you link back to my original recipe post. Thanks and happy pinning! Welcome! My name is Eve and I’m on a quest to make meals that are not only delicious, but also healthy and natural. I'm a mama, wife and foodie. I can often be found running around with my gorgeous guys, drinking iced coffee, or lurking on Facebook. Some people think I'm hilarious. And by some people, I mean my kid!